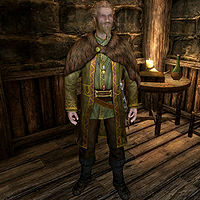 Asgeir Snow-Shod is a Nord warrior living in Riften. He works at the Black-Briar Meadery as Maven Black-Briar's investor and partner. His parents are Nura and Vulwulf Snow-Shod, and his brother is Unmid. He also had a sister, Lilija, who was killed while serving as Battle Maiden for the Stormcloaks. 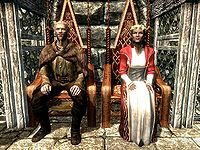 His family has connections to the Stormcloaks and his marriage to someone with Imperial connections is seen as a step towards reconciliation. He is marked essential until he becomes the new husband of Vittoria Vici in the Dark Brotherhood quest. Asgeir wears a set of fine clothes and a pair of fine boots. He is equipped with a leveled sword which can be up to elven quality. He carries two leveled gems, a key to his manor, and a selection of upper-class loot and gold. He will drop his wedding band if killed. If he is not killed during the related quest, the band will remain in his inventory unequipped and can be pickpocketed from him afterwards. If you give him a religious missive, Asgeir will respond, "Not really my usual read, but I'll give it a try." He shows that he is charitable, as he gives a coin to Riften's beggars, saying, "Of course, here. Be well." to Edda and "Absolutely. Here you are. Be well." to Snilf. Asgeir will greet you with "Sorry, I'm afraid I can't help you much right now... I'm currently in mourning. ", "You've caught me at a bad time. I've lost someone dear to me." or "Yes? What is it?" Ending conversation with him will have him say, "It's been good talking to you." Should you ask why he is in mourning, he will tell you, "It was my sister, Lilija. She served as a Battle Maiden with the Stormcloaks. We recently heard she'd been killed... I... I find it difficult to talk about. Perhaps you'd be better off speaking to my parents about it. Anyway, I'm glad my work at the Black-Briar Meadery keeps me busy. Helps me keep my mind off of things." He will also confirm that he's involved with the meadery: "Yes, actually. I'm partnered with Maven Black-Briar. I put up a chunk of the gold she needed to get the place off the ground. We've been staggeringly successful so far. In fact, I'm almost surprised how quickly she's generated business for us. My name may not be on the label, but some of my blood, sweat and tears are in every drop. Uh, figuratively of course." Asgeir will describe his parents: "My father was a Stormcloak soldier in his younger days. Now he just walks the streets spewing his hatred and propaganda. My mother is the Priestess of Talos. She tends to the shrine and teaches his ways. I'm just not so sure she's delivering the right message." When confronted that he is at odds with them, he will deny it, saying, "Don't mistake my political beliefs as a substitute for my family values. They're still my parents, and I love them dearly. I just think they've let my sister's death skew their outlook on Ulfric and what he really brings to the table with this war. I'm not so certain that Ulfric's intentions are as noble as they think. I think Ulfric cares about Ulfric and the rest is a smokescreen." He will end with a request to keep his opinions secret: "I'd... appreciate if you kept my opinion between us. The last thing I want to do is have my parents 'lose' another child." During this quest, Asgeir will be found in Solitude as the proud groom to Vittoria Vici. When you approach him, he will greet you with "Make sure to get yourself something to drink." and "You hungry? There's plenty of food. Eat up, now." He may also jokingly say either "Now now, fella. Let's not get too close to my new bride, eh?" if you play as a male character or "Well aren't you a pretty thing? Should my new bride by [sic] worried? He he he he." if you play as a female character. You can congratulate him and mention how it's quite a day, which he will agree: "The best. Vittoria's a good woman. Any man should be so lucky. I know my father's not happy about me marrying an Imperial, but that's his problem." As Vittoria Vici lies dead, the now-widowed Asgeir can be found screaming, "My wife is dead! Dead!" Should he survive the wedding, he will now detest you for murdering Vittoria. Asgeir: "I'm sorry you disapprove, father. But I've made up my mind. I'm not a warrior, I'm a businessman." Vulwulf: "The only reason you have the gold for your 'business' is because I gave it to you." Asgeir: "I'll pay you back, if it means that much." Vulwulf: "It's not about the coin, it's about honoring your legacy by picking up arms and keeping this land free. The sooner you remember that, the better." Vulwulf: "Drink up, my boy! Drink to those who have fallen! May their souls find their way to Sovngarde!" Asgeir: "Take it easy, father. You're making a scene." Vulwulf: "I'll rest easy when we've driven every last Imperial pig back across the Jerall Mountains! Now, do me the honor I deserve as your father and drink up!" Nura: "How are things at the Meadery, my dear?" Nura: "Hush, Vulwulf... let the boy speak." Asgeir: "It's going very well, actually. The war hasn't even slowed down our production or shipping at all." Vulwulf: "Of course it is. That's what happens when you're partners with a corrupt Imperial whore like Maven." Nura: "Vulwulf! The Empire may be our enemy, but Asgeir is still our son and we're a long way from Cyrodiil." Asgeir: "Father, I promise you, this has nothing to do with Empires or politics. It's just business." Vulwulf: "It has everything to do with politics. Asgeir my son, you have so much to learn." This page was last modified on 31 May 2016, at 19:03.